As summer is here, so is the sweltering heat and with that we have you prepped with waterfalls in Madhya Pradesh to beat the heat naturally. Madhya Pradesh is truly blessed with nature’s abundance which includes breathtaking waterfalls unmatched for their ability to provide an easy escape from the scorching heat of a tropical summer. The waterfalls are fed by a number of rivers and their tributaries flowing across the length and breadth of the state. These include the Narmada, Chambal, Tapti, Son, Tamsa, Ken, Betwa and their tributaries. The Dhuandhar Falls in Jabalpur district is one of the most prolific waterfalls in the heart of Madhya Pradesh. Stemming out of the Narmada river in Bhedaghat, the scenery at this waterfall site is a sight to behold. What makes the Dhuandhar Falls an even more enchanting visit is the facility of cable cars that make for a thrilling experience. One needs to avail the cable car at Bhedaghat to cross over to the other side of the 30 metres waterfall. The name ‘Dhuandhar’ literally translates into smoky falls, as the waterfall gives off a smoky feeling and visual. Bahuti Falls located in the outskirts of Madhya Pradesh is considered to be the tallest waterfall in the region. It is fed by the Odda river which is a tributary of the Bihad river. The serene Bahuti Falls flows down the edgy Rewa Plateau and makes for a beautiful view especially during the heavy monsoons. Chachai Falls is closely located to Bahuti Falls and just alike the Bahuti Falls is enriched by the Bihad river, a tributary of the larger Tamsa River. The 130 metre high waterfall, flows down the rocky fringes of the Rewa Plateau. The whooping similarity between the Bahuti and Chachai falls often labels them as the enchanting duo of waterfalls making the Rewa Plateau one of the most fertile plateaus in the region. The Chachai Falls is considered to be the second tallest waterfall in Madhya Pradesh. The Pandav Falls takes its name from the Pandavas who occupy a central position in the Indian epic of Mahabharata. It is rumoured that the Pandavas came to explore the spot and chanced upon caves which they then inhabited and stayed in with their mother. 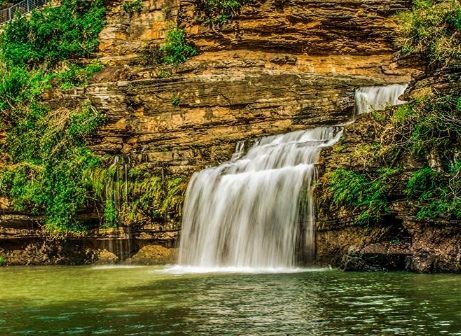 The prolific Panna National Park, which is known to be the realm of nature’s bounty, is complimented by the rushing Pandav Falls making for a popular tourist attraction. This waterfall arises out of a primary tributary of the Ken river and is cherished for its unnatural beauty and healing capabilities of the water. The Jamuna Prapat is a sought after place for family outings in the weekends, as revellers flock to this place to enjoy a brunch by the waterfall. The regional name for this waterfall is Bee falls, as it is believed by the locals that the waterfall gushing down from an extreme height has a stinging effect on those bathing in its waters. Jamuna Prapat, ‘prapat’ literally translating into waterfall is located in the small town of Panchmari, within the vicinity of the Satpura National Park, a popular tourist destination in itself. The Jamuna Prapat shares the fame with Rajat Prapat, a taller waterfall located at a close proximity to the Jamuna Prapat garnering an annual footfall close to thousands in the region.